Northwest Ohio Provides Medical Marijuana Recommendations for Certification to Qualified Patients. If You Would Like to Set Up an Appointment to Please Call Today at 419-725-6290. We Are Open 6 Days a Week! Since a law passed on September 8, 2016, the use of medical marijuana has been approved for some patients in Ohio who suffer from 21 different chronic conditions. If you suffer from a chronic condition such as cancer, fibromyalgia, or multiple sclerosis, and think that medical marijuana may be the right treatment protocol for you, please call Northwest Ohio Urgent Care in Maumee to schedule your consultation today. Our certified physicians can help you understand the potential risks and benefits of medical marijuana and can recommend it for patients for whom it may be a viable treatment protocol. In Ohio, medical marijuana is approved for treatment of 21 chronic medical conditions. These conditions are HIV and AIDS, Alzheimer’s disease, amyotrophic lateral sclerosis (ALS), chronic traumatic encephalopathy, multiple sclerosis (MS), Crohn’s disease, seizure disorders such as epilepsy, glaucoma, hepatitis C, fibromyalgia, inflammatory bowel disease, Parkinson’s disease, PTSD, Tourette’s syndrome, sickle cell anemia, traumatic brain injury, spinal cord injury or disease, and ulcerative colitis. It may also be considered for patients who suffer from severe chronic pain that has not responded to other treatments. You must be approved by a certified physician in Ohio in order to be eligible to receive medical marijuana. Home growth of marijuana plants is illegal in Ohio. At Northwest Ohio Urgent Care, our certified physicians can decide whether medical marijuana may be right for your individual situation. There are two main chemical compounds in marijuana called cannabinoids. These compounds are THC and CBD. THC can offer relief for certain health issues, but it is also the compound that produces the “high” most people associate with marijuana. CBD has been shown to help patients with certain medical problems, but without producing the same side effects associated with THC. The effects of marijuana can vary for each individual person and depend on the percentages of CBD and THC present in the strain of marijuana used. Medical marijuana can be ingested in a few different ways. By Ohio state law, marijuana may not be smoked in the traditional sense—that means Ohio does not allow for the “combustion” of medical marijuana—it can instead be used in oil form, in edibles, tinctures, or through the use of a vape pen. Side effects of medical marijuana can include feelings of relaxation and happiness, sleepiness, or in some cases anxiety. Larger doses can sometimes induce hallucinations or paranoia. If you are interested in undergoing a consultation for potential use of medical marijuana, please contact Northwest Ohio Urgent Care in Maumee, OH today. Our certified doctors can evaluate your individual medical needs and decide if therapeutic use of marijuana could be right for your situation. It is important to remember that medical marijuana is not right for everyone, but for patients with some chronic conditions, it can offer hope where there was not any previously. 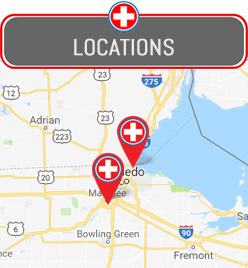 Let the experienced physicians at Northwest Ohio Urgent Care’s clinic in Maumee help you evaluate all of your available treatment options so that you can make the best, most informed decisions regarding your medical care.